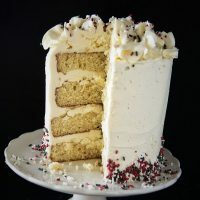 Eggnog Spiced Rum Layer Cake: Eggnog cake brushed with an eggnog and spiced rum mixture layered nice and tall and covered in White Chocolate Swiss Meringue Buttercream. Actually all indoor decor is up. And already I am happier. I’m not cooking Thanksgiving dinner this year so I don’t need to spend my weekend planning it. Most bloggers love this time of year because of traffic. While many of them like the traffic for increased income, I just love it because it means people are using my recipes. Which is the whole reason I have a blog. 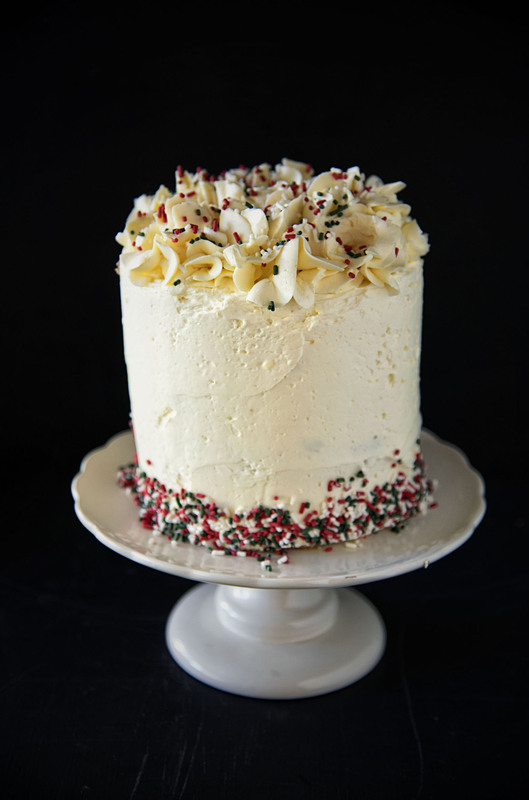 This cake maybe an eggnog cake but it isn’t super eggnog-y (that’s a word now). 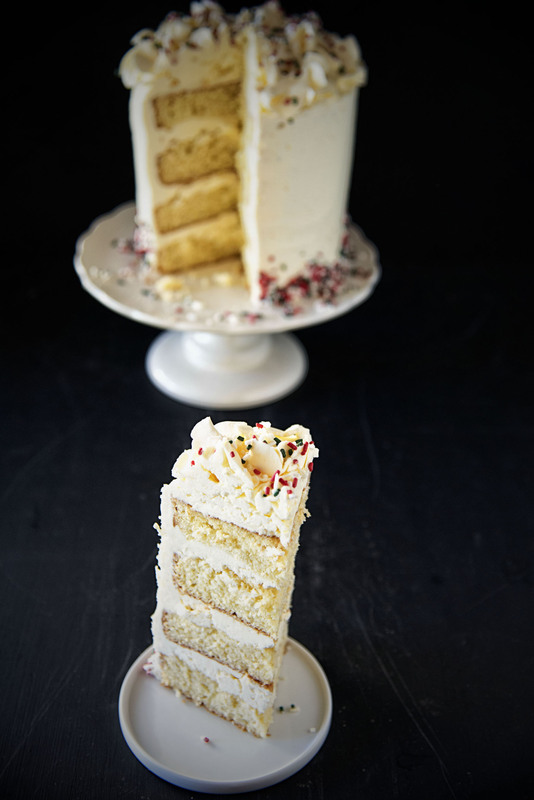 But you most definitely need fresh nutmeg in the cake. I have a nutmeg grinder and it’s awesome. Though I’m considering upgrading to this one. The one I have now is 24 years old but still works fantastic. 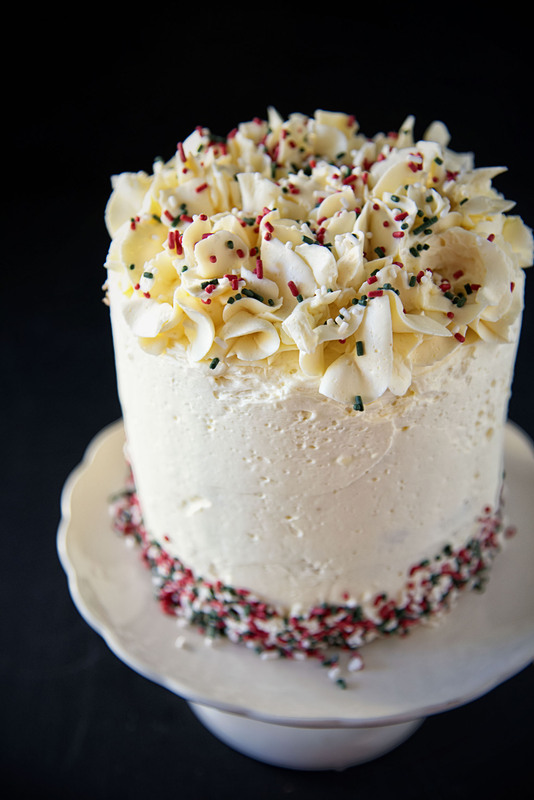 If you are not a fan of booze you can omit the rum and just brush the layers with eggnog instead. I’m fortunate that I have two local places that make really good small batch eggnog. You may use whatever eggnog you want…spiked or not but just make sure that it is FULL fat eggnog. In a small bowl whisk together the eggnog and spiced rum. Set aside. Grease three 9-inch or four 6-inch (which is what I used)round cake pans and line the bottoms with parchment paper. Add the vanilla and then the eggs and egg yolks one at a time, scraping down the bowl after each addition. In a separate bowl, combine the cake flour, baking powder, baking soda, nutmeg, and salt. Add to the mixer in 3 additions, alternating with the eggnog, scraping down the bowl as needed. Divide the batter evenly between the prepared cake pans and bake until edges are golden, and the tops bounce back when gently pressed, about 20 minutes. 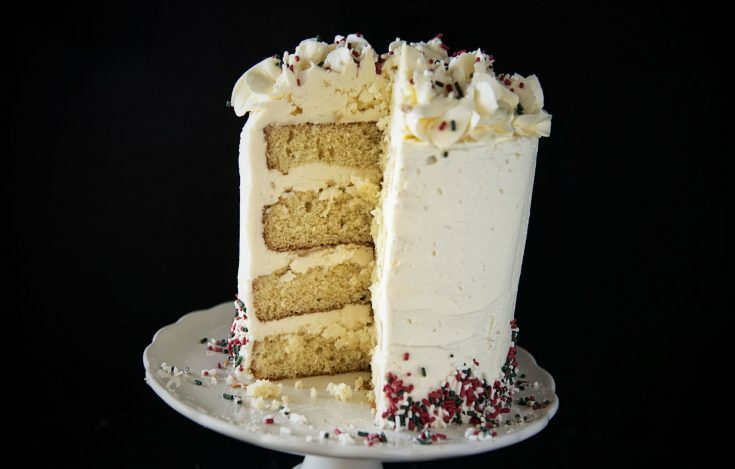 Brush each layer with eggnog/spiced rum mixture. Add 2 tsp. spiced rum, melted white chocolate, and salt and beat on high for 1-2 minutes until smooth and creamy. Pipe some decorative swirls on top of cake and top with sprinkles (optional).